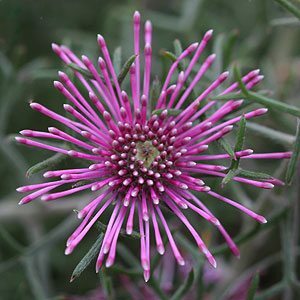 The candy cane Isopogon is Isopogon latifolius, a showy plant with brilliant pink to mauve flowers above deeper green foliage. The flowers appear in masses from late winter – spring through to summer. Reaching a height of around 1m in height with a similar spread, this is an excellent plant for the sunny garden border, rock garden or even grown in a container. Useful for mass landscape and roadside plantings, or use it as a feature plant in the garden where its height and brilliant flowers will make it a standout when in full flower. This is a hardy plant once established, drought and frost tolerant. It does require a well drained soil and a sunny position to do well. Tolerant of coastal conditions, a versatile performer in the garden. A little additional water through the first summer may be required. Isopogon latifolius can be pruned, however it is best to prune lightly after flowering (deadhead) to maintain shape. Suited to growing in larger containers. Drought and frost tolerant once established.